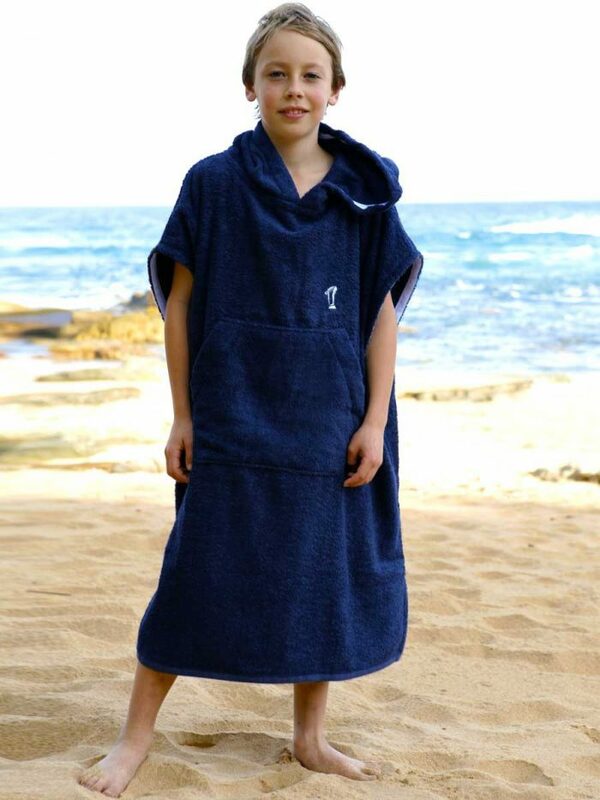 ‘So easy for kids to change in’ This beautiful quality surf poncho & changing robe in navy terry towelling allows kids to cover-up discretely when changing in public. No need for stumbling behind cars & trees while they get in & out of swimwear & wetsuits. Poncho fit is deliberately loose allowing room to move with ample fabric to dry arms, legs & face. Perfect for carpark changing, these cosy towelling ponchos will also keep that icy cold wind off after swimming or surfing plus keep precious skin safe from sun. Plus they are expertly cut & styled to look fantastic on. This surf poncho and changing robe is smart & stylish in classic navy. Ever popular for swimming, surfing & all other water sports. Plus a great beach & pool accessory for family holidays to the beach or seaside. 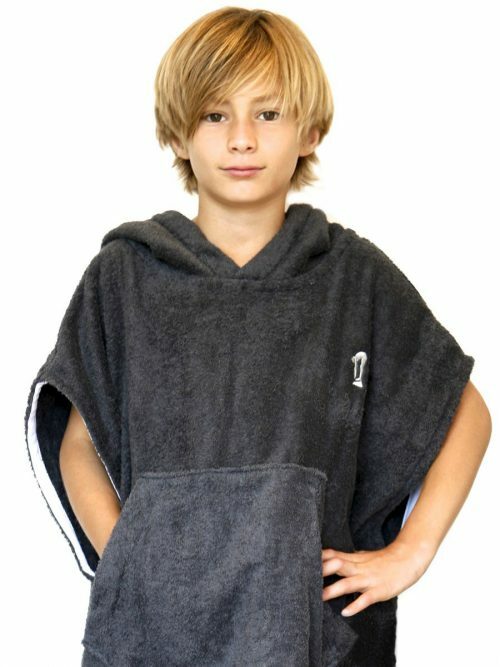 Surf Poncho Features include: – Clever design with large, easy access arm holes that makes changing quick & easy – Luxurious oversized hood to dry hair plus keep out sun & wind – Superior 100% cotton towelling fabric that is soft, warm & super absorbent – Large kangaroo pockets for accessories plus to keep kids hands toasty warm – Easy to take anywhere. To the beach, the pool, the boat or the lake. Keep in the car – Built to last with superior towelling, fully covered seams & quality finishing. – Easy care. 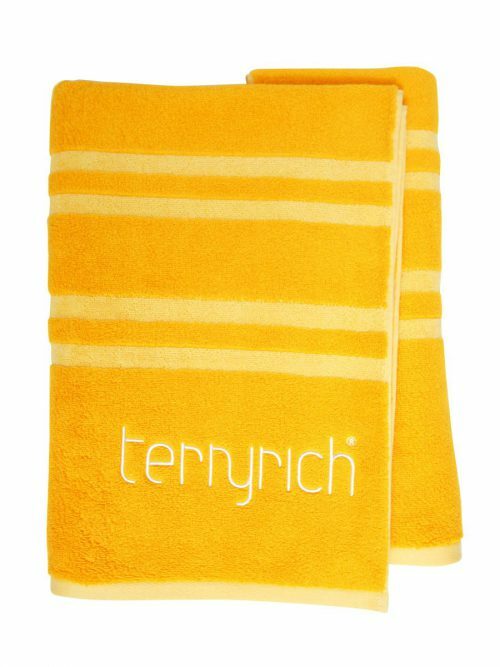 Fully machine washable – Made in Australia to the highest Terry Rich making standards. Also available in small, regular and extra long sizing for adults. See Adult Surf PonchosMake trips to the beach & pool a breeze with this versatile beach accessory that not only works but also looks great on! Earn up to 450 Points. 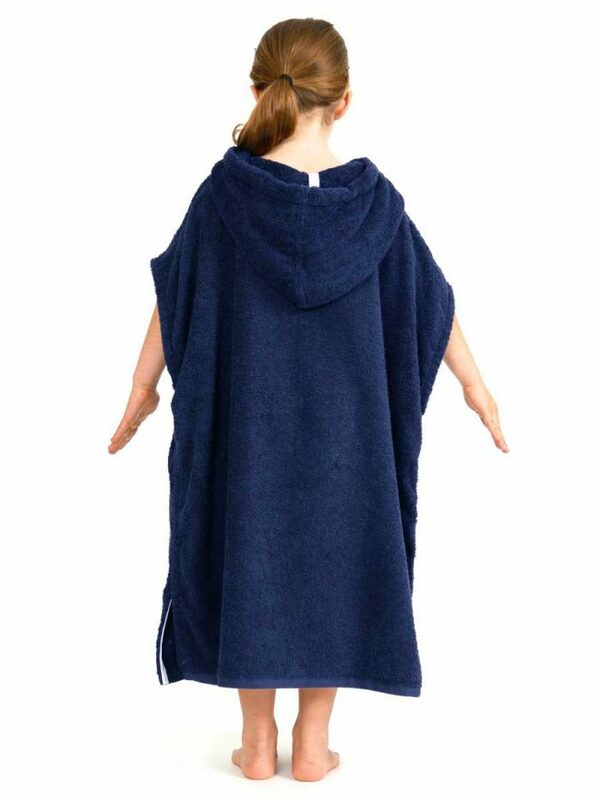 A beautiful quality & stylish changing robe that allows kids to cover-up discretely when changing in public. 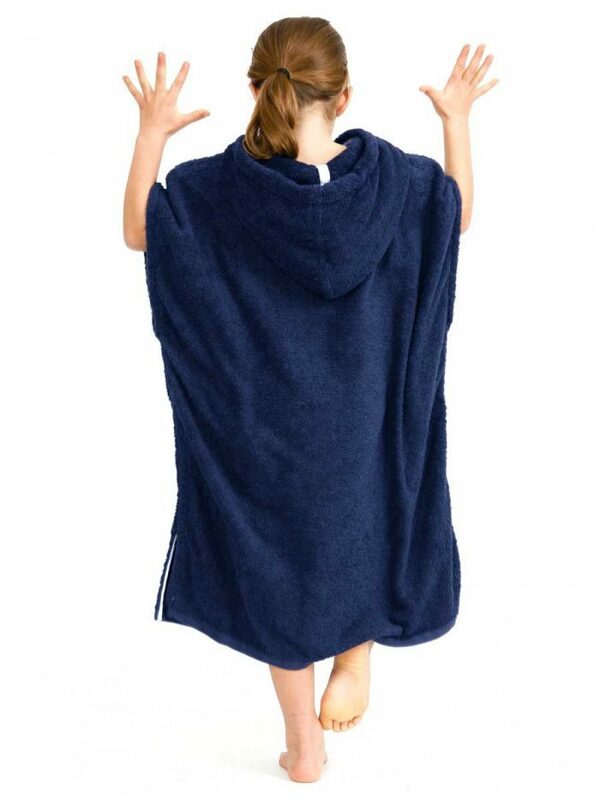 No need for clumsy stumbling with a towel while trying to get in and out of swimwear or wetsuits! 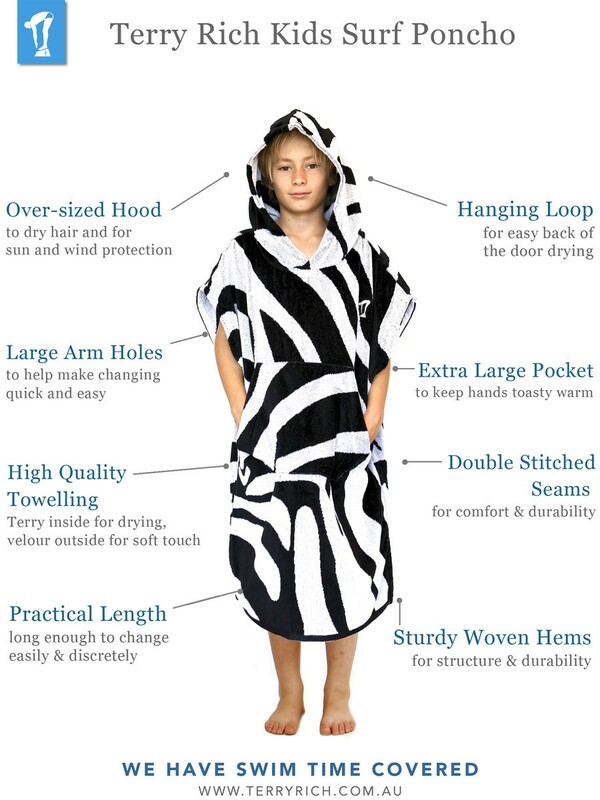 Poncho fit is deliberately loose to allow room to move while changing & ample fabric to dry arms, legs & face. 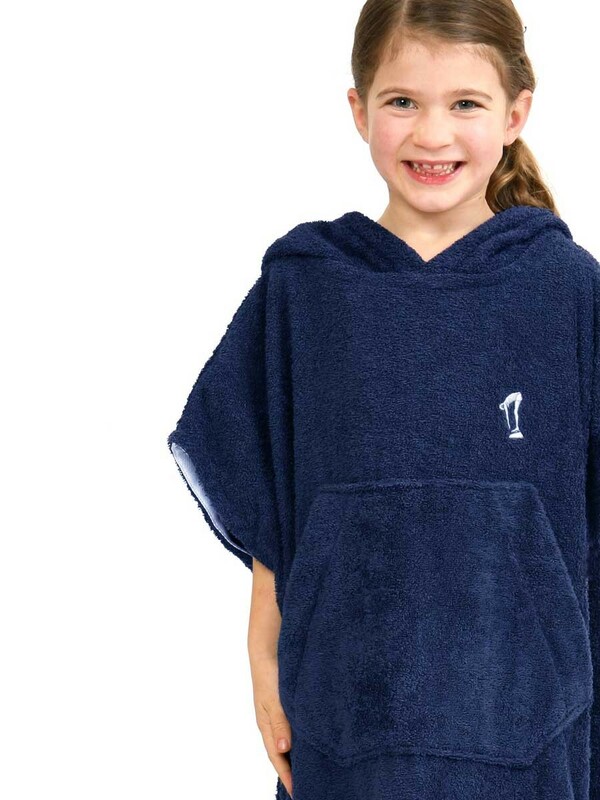 Perfect for carpark changing, these cosy towelling ponchos will also keep that icy cold wind off after swimming or surfing plus keep precious skin safe from sun. Expertly cut and styled to look fantastic on. It is smart & stylish in classic navy. Ever popular with kid swimmers, surfers, windsurfers, sailors, kayakers and other outdoor water sports lovers as well as being a great beach & pool accessory for family holidays to the beach or seaside. 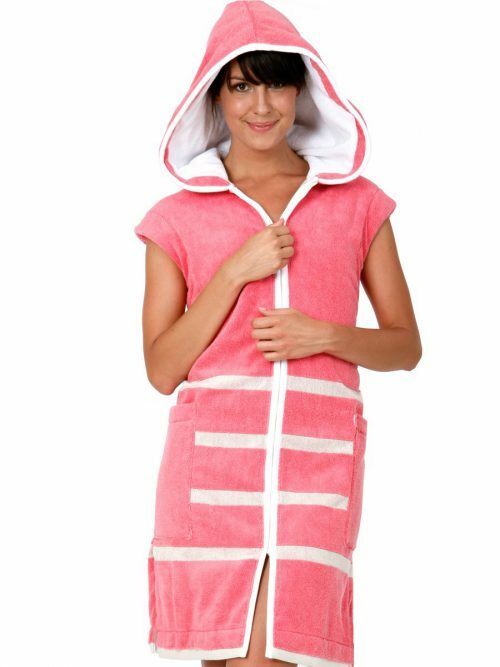 Surf Poncho Features include: – Superior 100% cotton towelling fabric that is soft, warm & super absorbent. So they warm & dry! – Clever design with large, easy access arm holes making changing quick & easy. – Luxurious oversized hood that will dry your hair plus keep out sun & wind. – Large Kangaroo pockets to hold your accessories plus to keep hands warm in the cold & wind. – Easy to take anywhere with you. To the beach, the pool, the boat or the lake. Keep in the car – Built to last with superior towelling, fully covered seams & quality finishing. – Easy care. 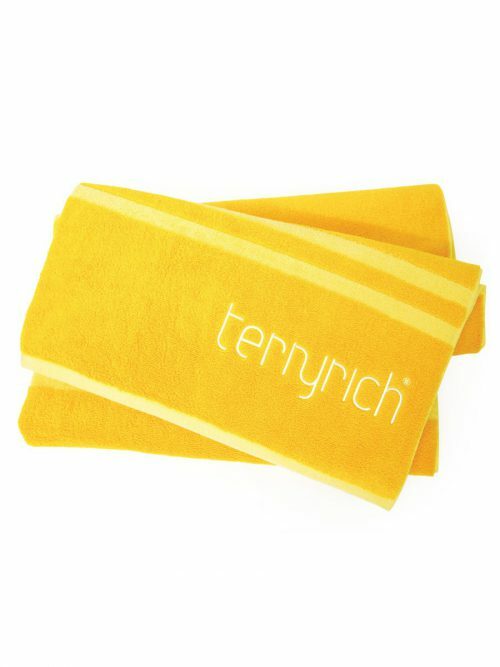 Fully machine washable – Made in Australia to the highest Terry Rich making standards. 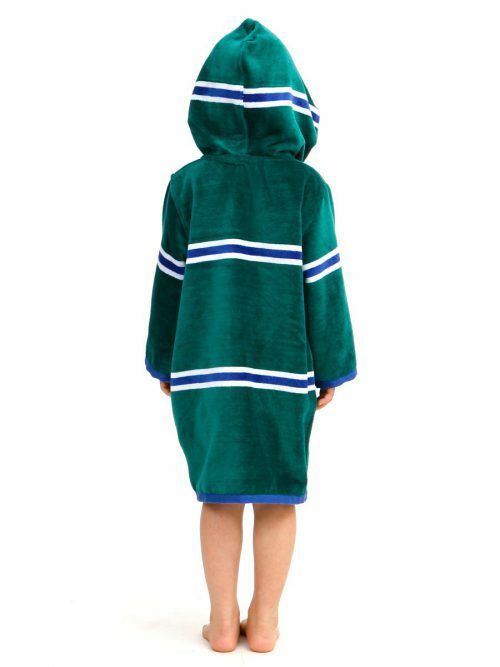 These surf ponchos are such a great investment for any child that regularly swims, surfs or paddles, especially on icy cold mornings or windy afternoons. Also perfect for kids not skilled with wrapping and securing a towel when changing.